Remember a while ago I was attempting to create a concert ticket collage and instead I ended up making a restaurant collage? 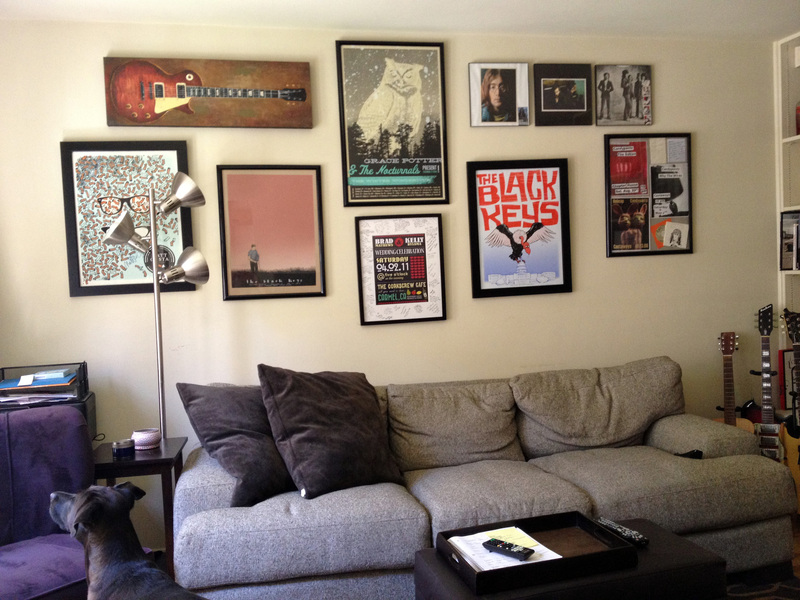 Well before I veered off into that secondary project, I was hoping to create a collage wall of our collection of concert posters, framed records, and other music stuff. Because Brad and I might be up to our taste buds in the food industry, but music is what brought us together. It is my craft and the soundtrack to my life. It runs in our veins. And we had a whole lot of stuff rolled up under our bed while our living room walls sat naked and white. This had to be remedied. So before our epic 4th of July pig roast, I decided we must finally get this collage going. 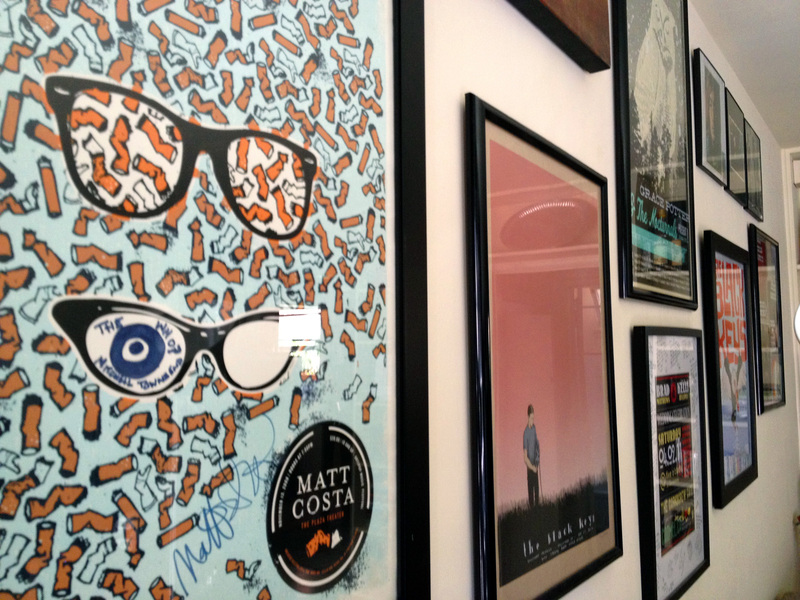 Everything was already framed, it was just time for the hard part. Getting them on the wall. I always see these amazing frame collages on Pinterest and on my Reader in blogs I follow. And they always fit together so effortlessly. I knew it wasn’t going to be that easy. So I pulled out my old Christmas wrap that I’ve been using for the past two years now, and I traced all of the frames we’d be hanging, making sure to label every one as I went. After cutting them out, I arranged them on the wall the way I wanted them to be hung. Believe me, this was not my first attempt. 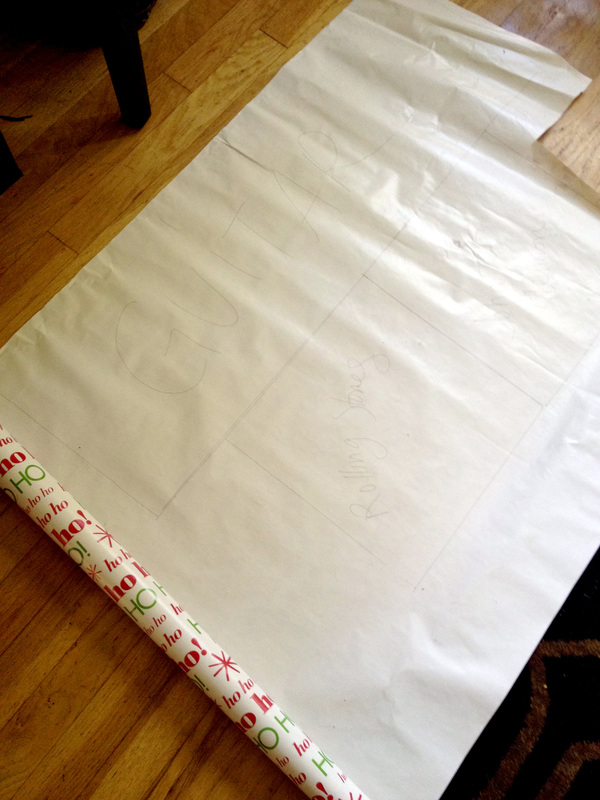 And the fact that we have the most comfortable couch in the world is usually fantastic – but it is not at all helpful when you’re 5’1″ and attempting to tape flimsy wrapping paper almost all the way up to the ceiling. Advice for anyone thinking about doing this. Get a step stool or a ladder. Or a tall person. Or just a much less squishy and comfortable couch. So once I came up with my arrangement I waited for my tall person (Brad!) to come home and do the dirty work. 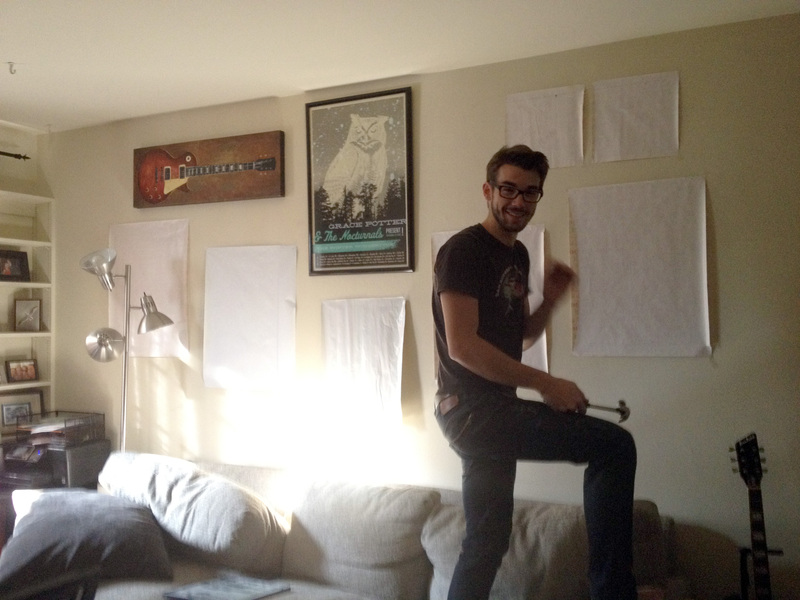 Brad measured and nailed and ripped down the wrapping paper like it was Christmas morning. 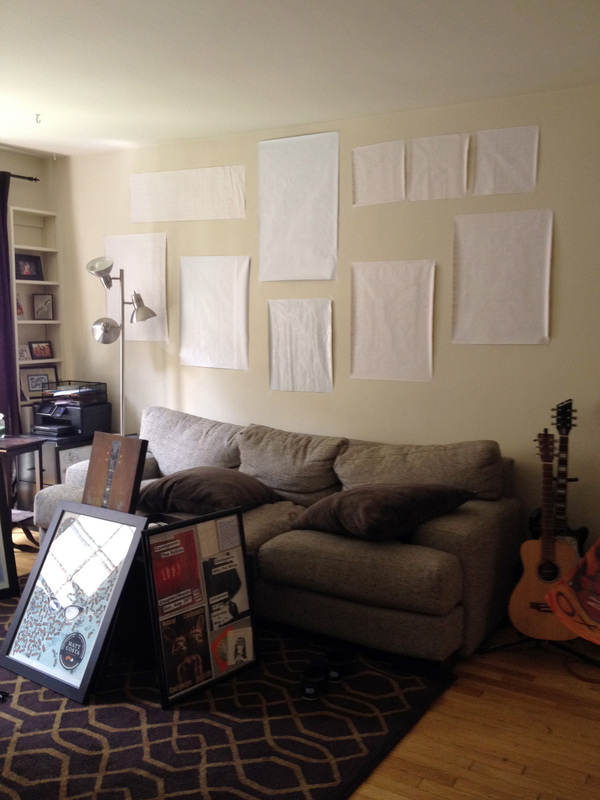 And once he had hung every last frame, we had our very own collage wall. Complete with our wedding “concert poster”/guestbook front and center, it turned out exactly like I’d hoped. One day I will still put together a concert ticket collage. 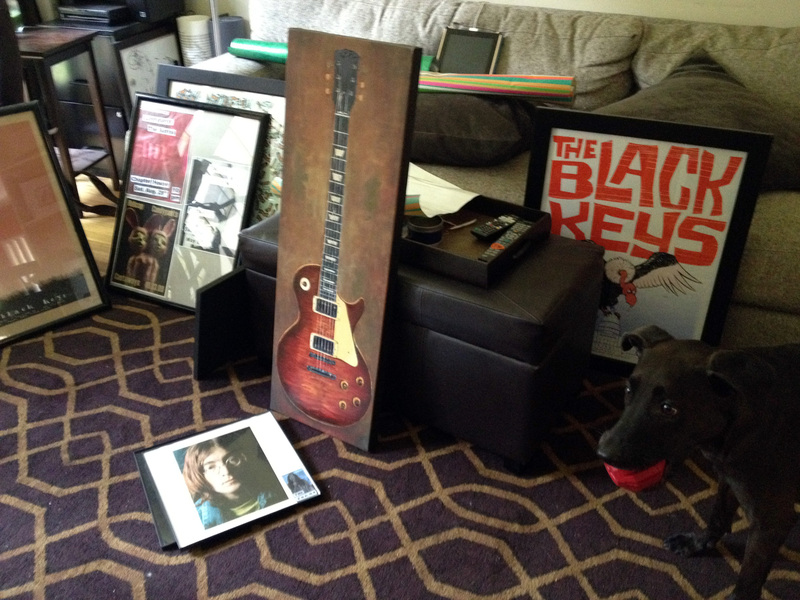 But for now, I’m pretty darn happy with all of the music memorabilia that greats me every time I want to relax on that big, comfy couch of ours.